People either seem to overestimate or underestimate the potential impact of internet-based social media on social and political change. I think it’s because they are confused about just what something like Facebook is replacing. 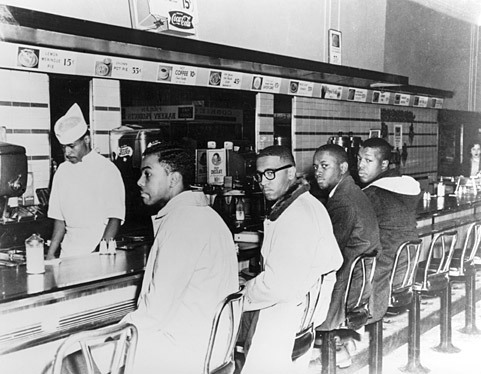 As example: Malcolm Gladwell ( New Yorker) briefly retells the tale of the Greensboro lunch counter sit-in to argue that the new social media can’t support such heroic, radical, and effective actions. The argument is too simple (standard professor’s criticism, alas), but the story is virtually always worth retelling: Ezell Blair, Jr., Franklin McCain, Joseph McNeil, and David Richmond, freshmen at North Carolina Agricultural and Technical College, stayed up talking all through a Sunday night. They decided to desegregate the South. (I always imagine other students on their floor stopping by, hearing their plans, and dismissively deciding to study for biology exams instead.) On Monday, February 1, 1960, they shut the Woolworth’s lunch counter down; they returned throughout the week, accompanied by scores of other students, their efforts spreading to other stores in Greensboro. And sit-ins spread throughout the South. The four young men were courageous; they were also already veteran activists, well-acquainted with the issues they were confronting, and inspired and informed by earlier sit-ins. They were acutely aware of the risks they took. They were also, as Gladwell notes, friends. They trusted each other, supported each other, and were well positioned to push each other to do risky things that must have been very scary. In effect, the four had forged a camaraderie of the trenches well before they actually got into those trenches. But such closeness can come out of shared struggle as well. Gladwell finds social media wanting in developing the thick ties that serve as the basis for high risk activism. Pointing to the civil rights movement, he notes the critical role of real–and hierarchical–institutions, particularly churches, and well-established organizations often led by ministers. Such organizations could support long and difficult campaigns, make strategic decisions, and even enforce discipline. He correctly notes that the first four Greensboro sitters-in were members of the NAACP Youth Council. He neglects to mention that they were frustrated with what they saw as an approach toward social change that was too passive and too slow (they would make the same charge against the Southern Christian Leadership Conference). The Greensboro sit-ins led to the creation of a new organization, SNCC (Student Non-Violent Coordinating Committee) that was deliberately decentralized, so as to give energetic young people a route to direct action. Gladwell emphasizes the power of conventional resources, particularly money, leadership, and organization. This entry was posted in Uncategorized and tagged civil rights, Greensboro, Jonathan Rauch, Malcolm Gladwell, organization, sit-in, tea party. Bookmark the permalink. 6 Responses to Tweet the Revolution?